A kid brought one to our babysitters house one day. Coolest thing ever! I imagine those things broke often with the abuse they took. YES! This is the exact lightsaber knock-off I had as a kid. It really was just an off-the-shelf flashlight with a white tube, plus it had a black "hilt guard" which was, in all probability, another re-purposed part. But, it sure did (literally) beat the heck out of the inflatable lightsaber that Kenner put out! Let mr lucas boil and steam. Who asked him to sell his life and legacy? Not us although he could have done better on the 2nd half of his.....stories? What's really frightening is I remember the info-mercial. It was about how you can become a millionaire by marketing a great toy idea. The unspoken "catch" was you either had to come up with a brilliant (no pun intended) knock-off or recognize the potential for a great toy someone else invented, buy it out from them for a pittance and then develop it using the show's Secret Proven Method. As far as info-mericals went, it was a stand-out for the level of openly ruthless greed that accompany the "get rich quick" mentality. Other success stories included the Ant Farm and The Spud Gun. These days, with vastly more sophisticated (and aggressive) corporate legal teams, I wonder if "The Force Beam" would be able to go quite so far in its "inspiration". 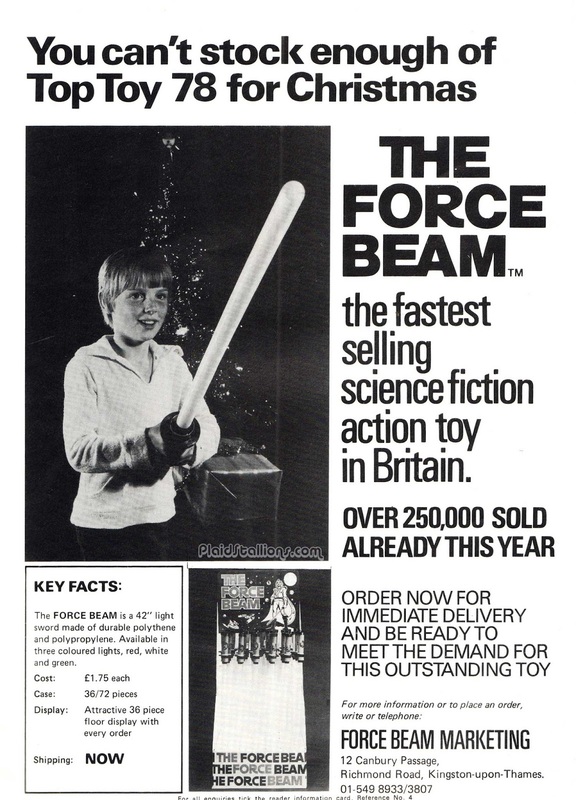 The Force Beam is a very close copy of the original toy lightsaber even copying the inflation collar. I also remember that infomercial with the smarmy guy claiming he invented the toy lightsaber. He basically talked like HE was the one who created all Star Wars toys, I'm misquoting but it was something like "When I saw Star Wars, I walked out of the movie thinking the toy making potential was fantastic!" Yeah, NO ELSE thought that. Not like Lucas was shopping the toy rights around for about a year previously, and then sewed up the royalties for them with his new contract with Fox. Pretty sure that guy was the gaffer at the access TV station it was filmed at.